The basement of our office building had all kinds of things in it. It’s kind of the dumping ground for extra office supplies, santa decorations, etc. They have remodeled and it’s neater now though. At one place, I encountered a box of the PIs old university id cards and something that took me a while to identify: punch cards. Old computer punch cards. So very indicative of the way the project was run. My mom had a bunch of those in her office from when she was a grad student and that’s how they entered grades back in the day. or it wouldn’t type anymore. My father used to take dot matrix paper home so I could draw on the back. Fun stuff! Nicoleandmaggie started using email on a Unix system in, like, late 1993/early 1994. And yet, our blog looks like this. Um, I still get some mainframe e-mail. We’re beyond the punch cards, though. ~ Pick up box of Hawaiian decorations. 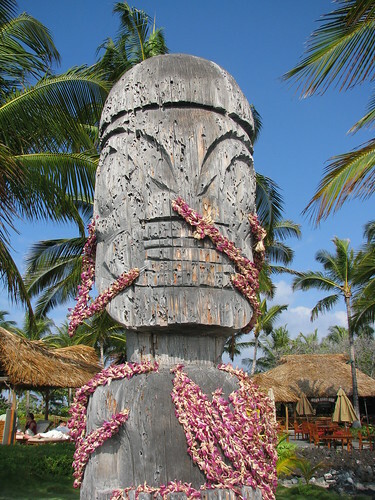 ~ You pick up the box of Hawaiian decorations and find a portal. ~ It is dark. You have been eaten by a grue. I love the Super Mario Brothers nod! When my agency moved offices, we pulled out one of the secretarial desks that had been up against a wall. Lo and behold, we found numerous notarial stamps, some wooden which were meant to be used with ink, many metal ones that embossed paper, and all rather lovely what with the names of secretaries long gone and dates gone by. The earliest was from 1967 (which I scarfed up because that was the year I graduated high school). That sounds kind of cool, actually. Cooler than ersatz Hawaiian decorations in a lab building, anyway.